Clients will pay for value, especially when it’s obvious to them how what you’re giving them will generate an ROI for their business. Very often we have clients that don’t understand the full scope of website management and maintenance, and what would help to win them over is a report that shows them the true value of your work. 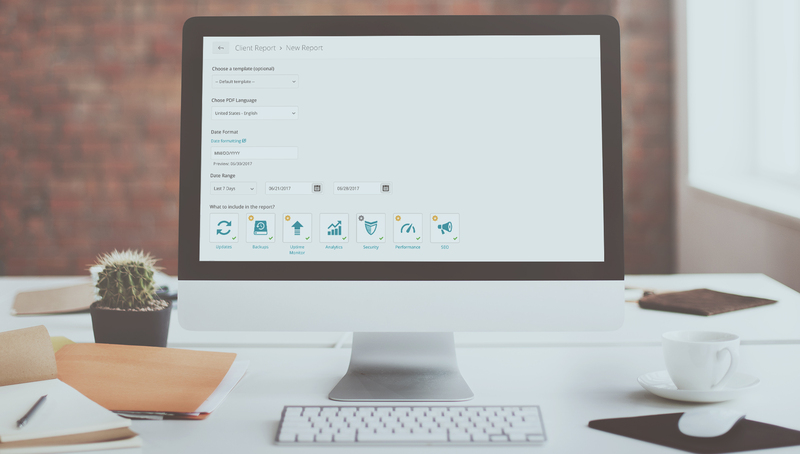 Here is how to get more monthly revenue by using ManageWP Client Reports. As a freelancer you are familiar with the concept of value-based pricing, presenting yourself as a long term investment. In the game of website creation and design, to make yourself a multiplier in the business of your clients, and not just a one-off expense, you want to offer affordable long term solutions that can maintain the quality of your client’s website. In other words, website maintenance as part of the deal. You want your client to see you as the whole package. The business and creative consultant as well as the technical support. The real work goes into the business consultancy, focusing on driving revenue for your clients through their newly built website, and the technical support is the long term maintenance, which can often result in additional projects and definitely gives you, as a freelancer, a steady income stream. How do you provide value on a monthly level to your clients when it comes to maintenance? You just landed yourself a new client. It’s a veterinary surgery, that has a great client base, in fact they are too busy and can’t take on more clients, but they need new vets. The surgery owners are not web savvy and have realized that new graduate vets search for jobs online. Their solution is to hire you to build a website and attract new hires. They are looking for a one time fix, the building of their website. Your aim is to offer them a long-term solution that includes monthly maintenance of said website. How do you go about convincing the owners of the veterinary surgery to leave you money every month? The answer is Client Reports. How to pitch Client Reports to get more clients on your monthly plans? Website maintenance can often seem to your clients as a ploy to charge more money. It’s not a concrete concept. They understand that by giving you money you will build their website, so they see these results clearly. What are the visible results of website maintenance? Well, if their website crashes, or there is a security breach you will detect it and fix it. But, that is only visible if there is a problem, which is a double-edged sword. They see that you are there to help, but they also only see the negatives, and until a problem occurs how are you going to convince them that they need you? So, you need to present your work (justify to them your cost) on a monthly basis. This is where our Client Reports come in handy. 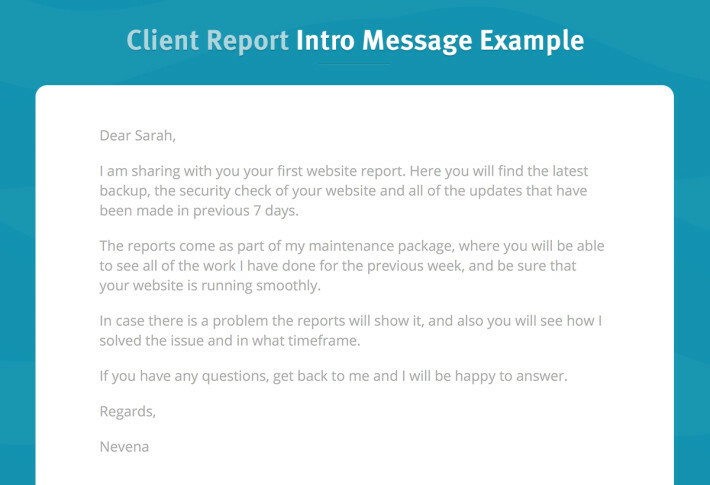 By sending your clients a template report as an example you can use it to explain what you are able to offer them (backup solution, monthly security checks etc) and show them evidence that will reassure them you are worth the monthly cost. They have a concrete report of your work = visible results. Pitching website maintenance starts with you explaining what you can include in your monthly maintenance report. Does your client’s website have a current backup? To really make the most of the Client Reports, put that extra effort in the introduction of the report. It gives it a personal, human touch. Here is what I did as a fist time report to my client Sarah. On your first meeting you would have already mentioned the monthly maintenance package, but your client probably forgot about it, and focused just on their website. So, when you finish their website, rather than just referring back to your initial conversation – show them what a report would look like and follow up with an explanation of all of the benefits. Client Reports allow you to offer neatly packaged proactive, multi-tired technical support solutions. How to increase your monthly revenue from individual clients with Client Reports? Once your client is on a recurring revenue plan, it means they already understand the value of website maintenance. You have done the hard work, but how do you use Client Reports to move your clients to the next paying tier? Let’s go back to our veterinary surgery clients. Their website is up and running, they have opted in for the basic maintenance plan that covers monthly backups, security scans and updates. There isn’t much that needs changing on their website, and since having it up they have seen an increase of job applications from new graduates. However, they are not the only veterinary surgery that is using a new website to attract new employees. They ask you for help. Great, you give them an estimate for SEO consulting, explain how ranking higher on google can help them be the top go to website for new vet graduates, and in addition to this you offer to add SEO tracking to their monthly plan for a small price. The SEO consulting you charge a fair amount, and because they are on your maintenance plan you were the first person they went to for help. When the SEO project is over, you then have additional value from it on a monthly basis. Client Reports are our way of helping you showcase your work to your clients. Monthly website maintenance takes up time and effort and deserves to be recognized. Remember, clients often don’t know what they need, but if you can show them the benefits of monthly maintenance, you will have no trouble increasing your monthly recurring revenue. Can you share with me how you hook your clients on recurring plans? Have you found a creative way to use our Client Reports? Thanks Gabe, glad to hear ManageWP is working out for you! If I missed your point, please give me some more context, and I’d be happy to help. Not sure if you had a chance to look at our Maintenance Mode, there we have pre made templates and also give you the option of customizing them. That means you don’t have to copy code just turn it on, and our tools can be bulk activated, which can save you time.